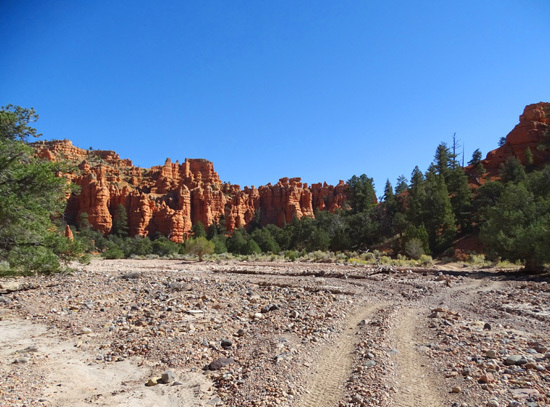 south to Red Canyon or north to Casto Canyon." 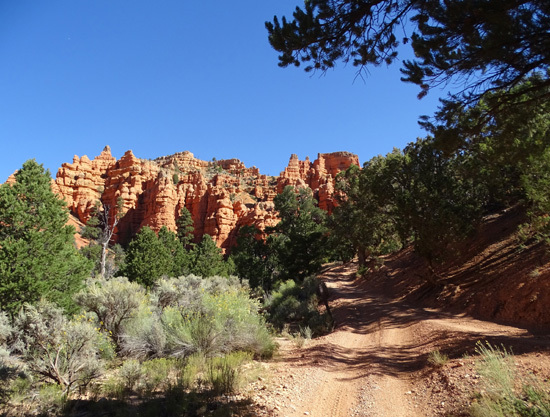 The Losee and Casto Canyon trails are both located back dirt/gravel Casto Canyon Road, which intersects with Scenic Byway 12 about half a mile before the "gateway" to Red Canyon as you're driving east toward Bryce Canyon National Park. 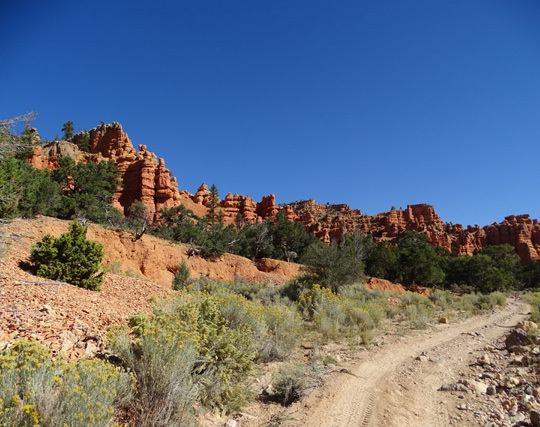 Losee Canyon is about two miles back this mostly-smooth Forest Service road. 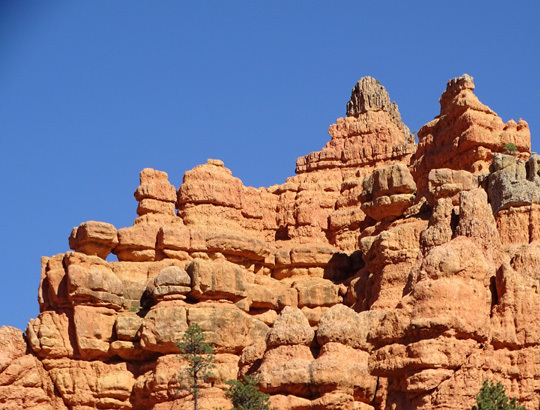 Casto Canyon is another mile farther. 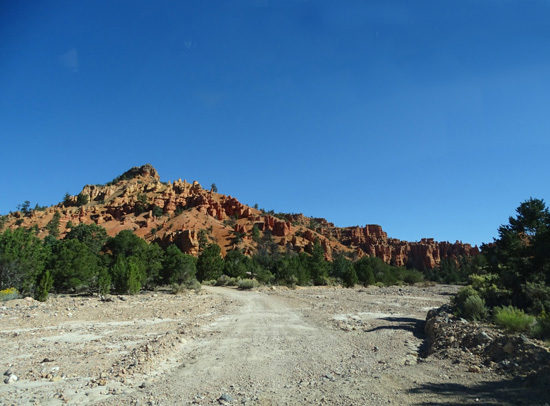 The road to this point is fine for any passenger car, truck, or RV. 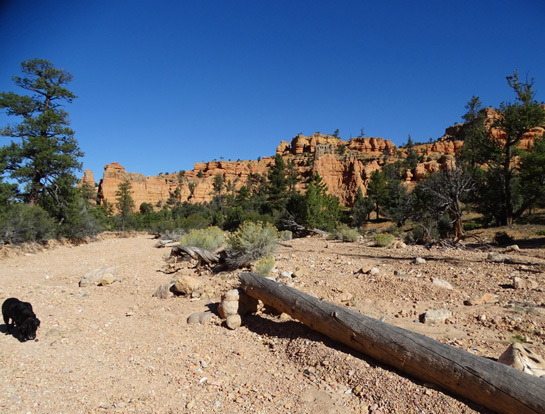 I marked both trailheads and the short distance I hiked back each canyon one weekday morning in late September. 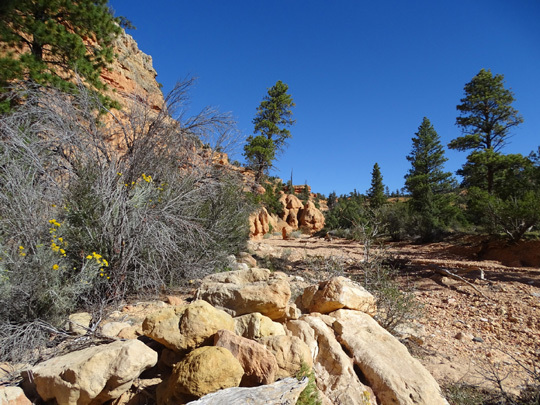 I had planned to hike back a couple miles in Losee Canyon that day with Cody. I had my Camelbak bladder full of water -- but forgot his water bowl. My bad. 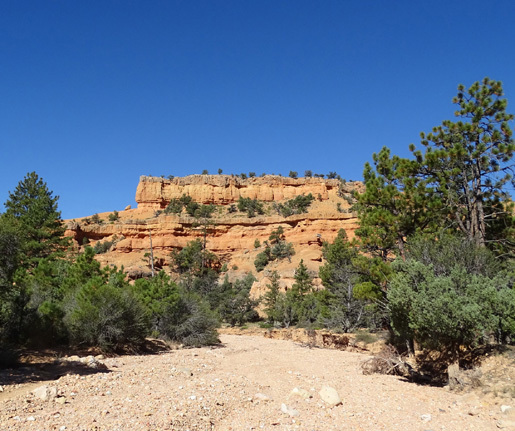 I went into Losee Canyon just half a mile and out, gave Cody water from his container in the car, drove back to Casto Canyon, and hiked half a mile into that canyon before turning around. 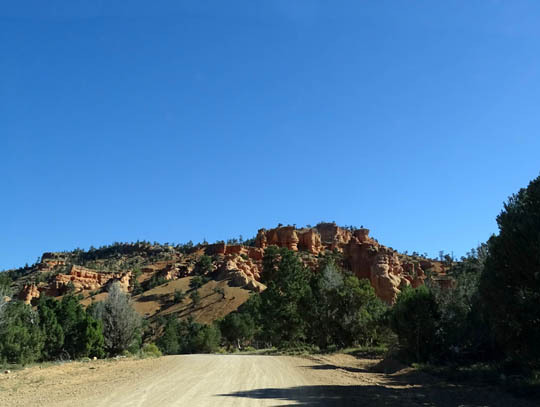 That gave us a total of two miles but it didn't give me much of a feel for either canyon except that I liked the first half mile of Casto Canyon better. 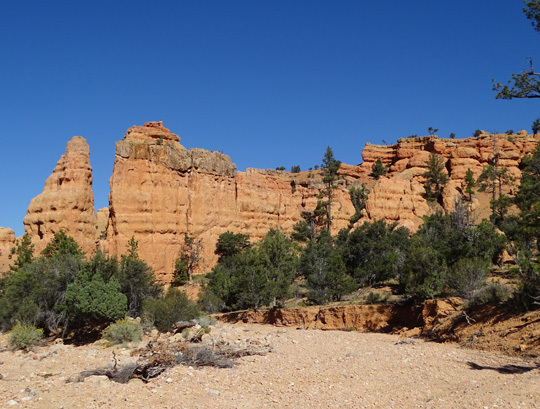 I didn't go back to hike again in either canyon during our fall visit to the area. 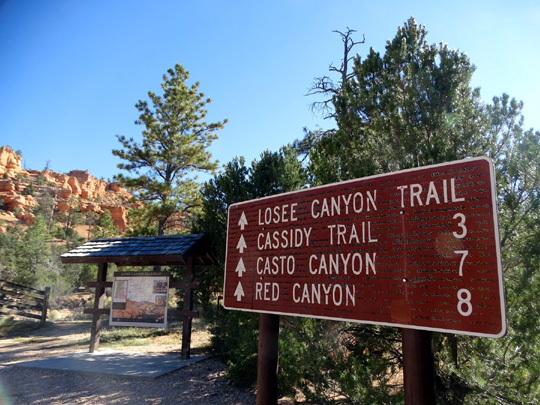 In May, 2016 I did the whole Casto-Cassidy-Losee Loop (about 12 miles) so I'll report later with much more information and many more photos. 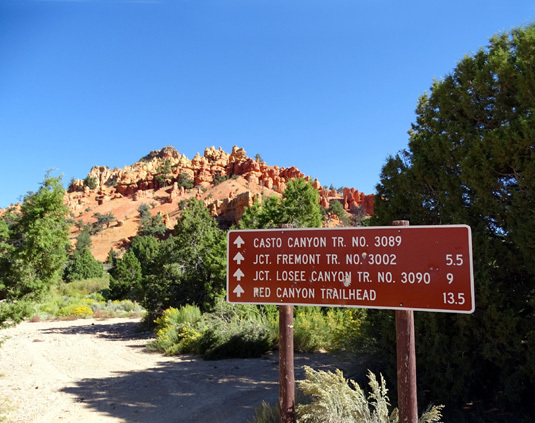 This trail starts on Casto Canyon Road, heads east, and gradually rises 570 feet over three miles to the Cassidy Trail. 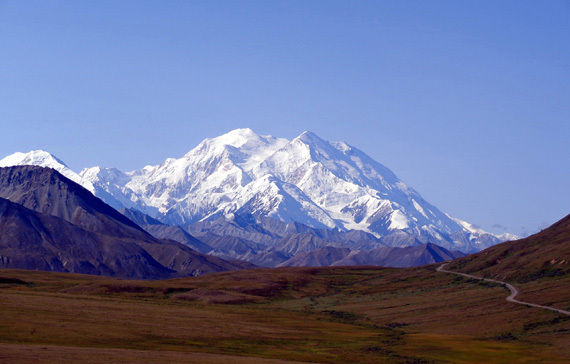 It is open to hikers, cyclists, and equestrians. 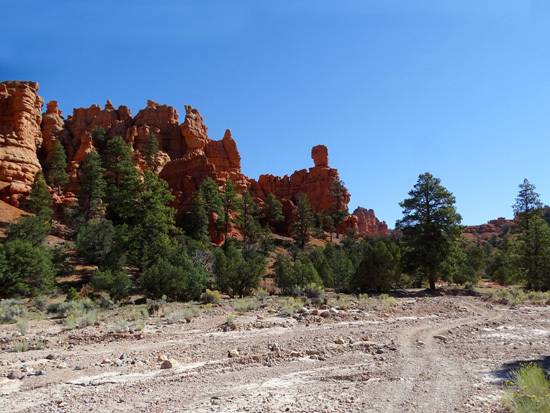 There is plenty of parking at the trailhead or across the road for passenger vehicles and horse trailers. 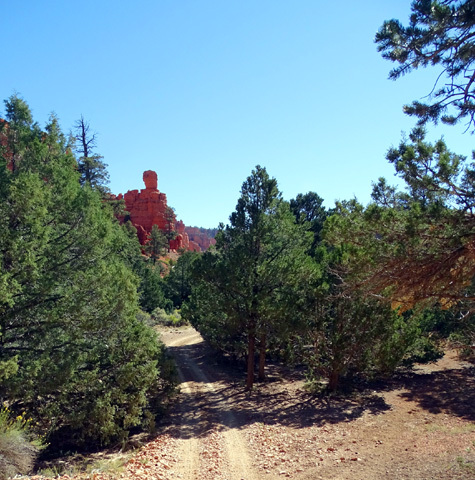 This is also the trailhead for the Arches Trail so it may get crowded on weekends. 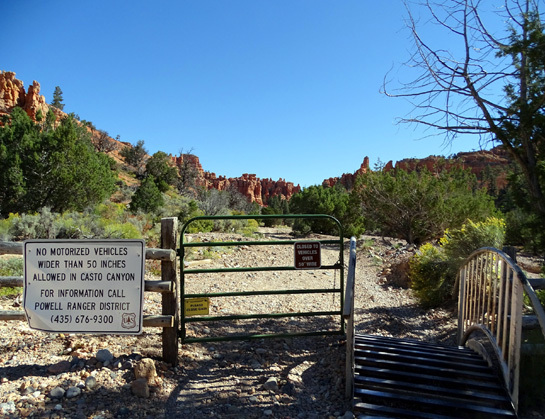 The day I hiked back the canyon with Cody there was only one other vehicle at the trailhead but I noticed both ATV and horse trailers at the beginning of Casto Canyon Rd. 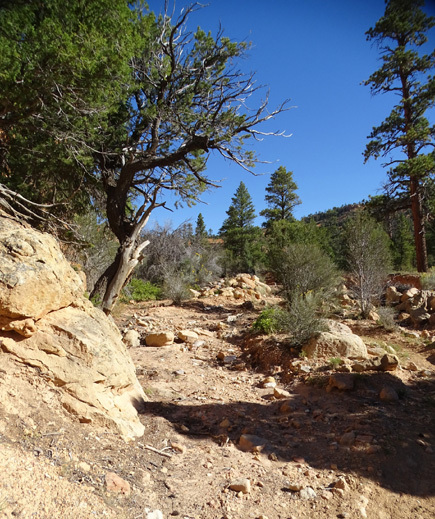 I didn't see anyone else during the short time I was on both these canyon trails that day, however (and surprisingly few when I did the whole 12-mile loop the next spring) . 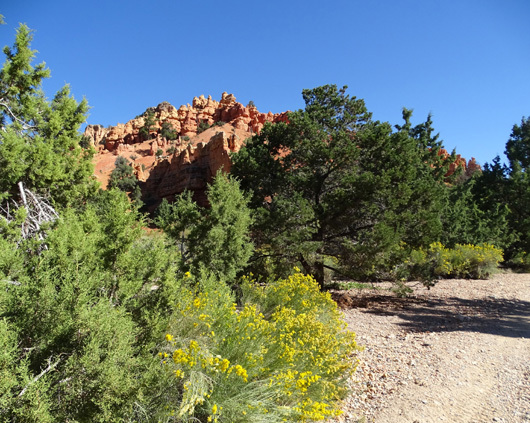 Some folks start the hike on a single-track trail in the parking area (two photos above). 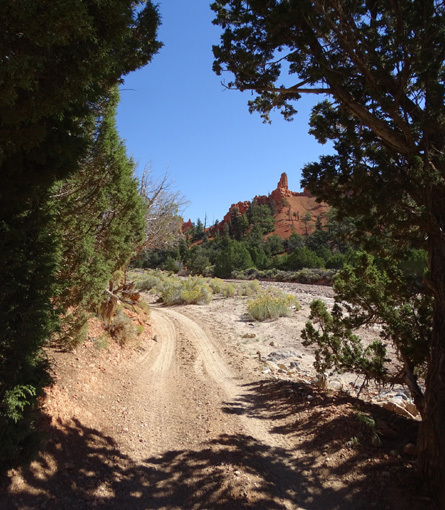 I went out that way and came back in the wash when I saw a trail going through it, too (photo directly above). 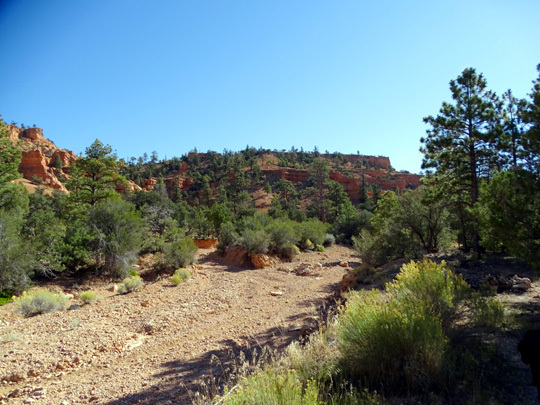 I think the trail through the wash is probably what the equestrians use the most. On this trip the wash was completely dry. In May of 2016 there was water flowing across the road but I crossed OK in our Odyssey minivan. 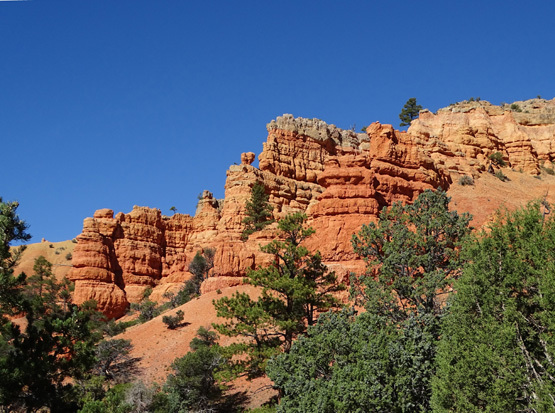 The web description of Casto Canyon Trail reads, "With colorful red rock formations and classic canyon scenery, you won't want to miss this one." 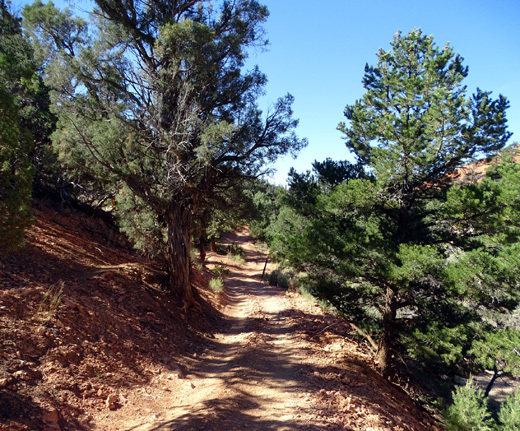 I did enjoy the first half mile of the trail this fall -- and the rest of it nine months later. See the little "window" on the left? 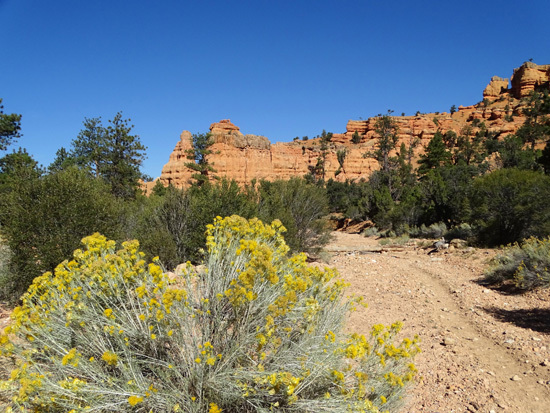 I look for those on every trail in Red Canyon. There is a little bit of parking on the right near the trailhead plus a good-sized parking area on the left across the road. 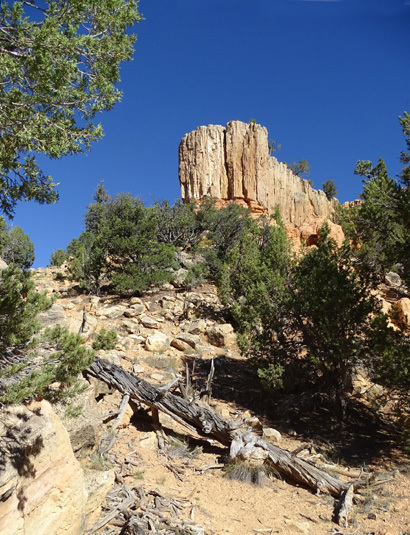 This trail very gradually ascends through the canyon for 5� miles to the Cassidy Trail, gaining only 800 feet of elevation in that distance. The trail crosses the wash a number of times and sometimes goes right through it. 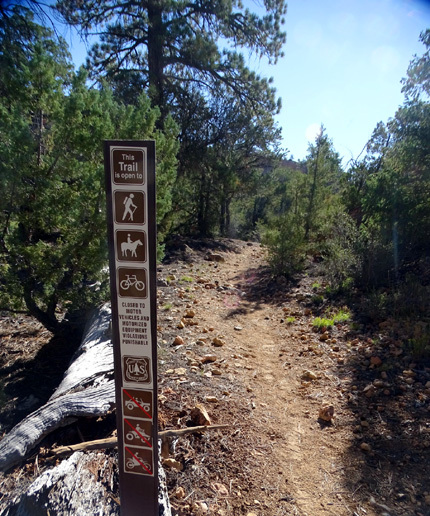 ORVs can't ride on the Cassidy Trail so they have to veer off prior to that on either the Barney Cove or Freemont trails. 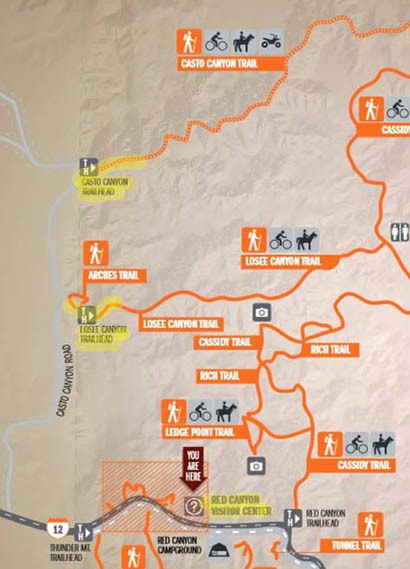 I didn't show those on the map segment above but you can see the whole trail network at the USFS website link. 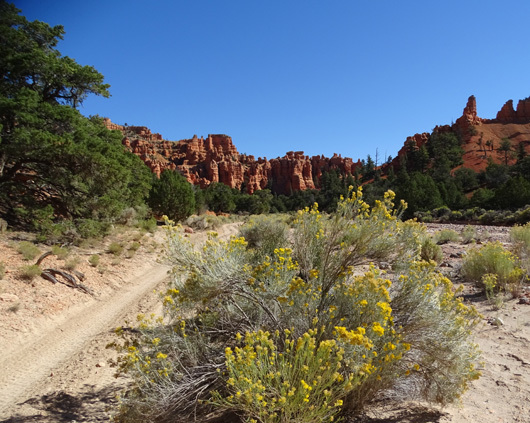 These two trails through the canyons are even hotter than trails in Red Canyon that get up on mesas where there are some breezes, and there aren't very many trees along the washes for a shady respite. Nor was there any water in the wash in the fall (there was a little in the spring). So take plenty of water for you and your critters, if you hike or ride with a dog or horse. 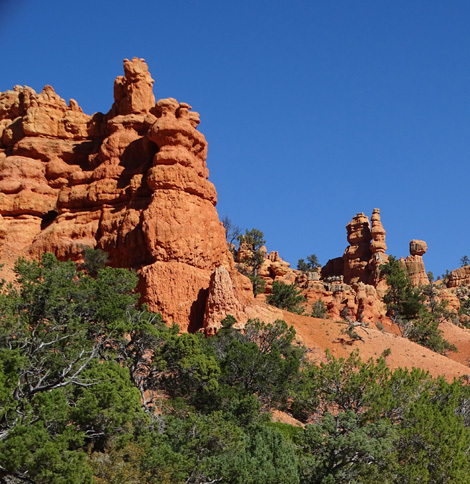 If you aren't able to hike, run, or ride these trails consider a guided ATV or horseback ride so you can see these trails close up. There are businesses in the area that provide these services.